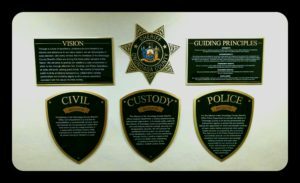 Integrity: We are committed to uphold our position of public trust by living up to our Sworn Oath and by maintaining the highest ethical standards as set forth in the Deputy Sheriff Code of Ethics. Accountability: We hold ourselves accountable for our actions; freely admit our mistakes and we welcome the conversation and oversight that comes from this responsibility. We value our members and have confidence in their individual initiative and ability to solve problems. We believe that open, honest and sincere communication is critical to a healthy work environment. We value transparency as a vehicle to ensure the public trust, even in times of challenge. Community Safety: We are committed to public safety through community partnerships, preparedness, crime prevention strategies and steadfast enforcement of violations of the law. Customer Service: We are committed to professional and courteous service, with empathy and compassion infused into our unbiased actions. Excellence: We commit to EXCELLENCE, in all we do, with every contact, with every action; we work as ONE TEAM to attain the highest of standards. We take pride and receive satisfaction from giving our very best, every time.